Improvisational comedy might seem like something that's created entirely in the moment, but it takes dedication, practice and training to make a performance look effortless. So imagine the work required to create an entire festival of improv comedy. The inaugural DuoFest isn't the first local improv comedy festival, as producer Danielle Susi-Dittmore is quick to point out; Cedar City's Red Rocks Improv Festival, which has been running for over a decade, and Midvale's Wasatch Improv Festival, launched in 2018, provided both a foundation and inspiration from which to draw. 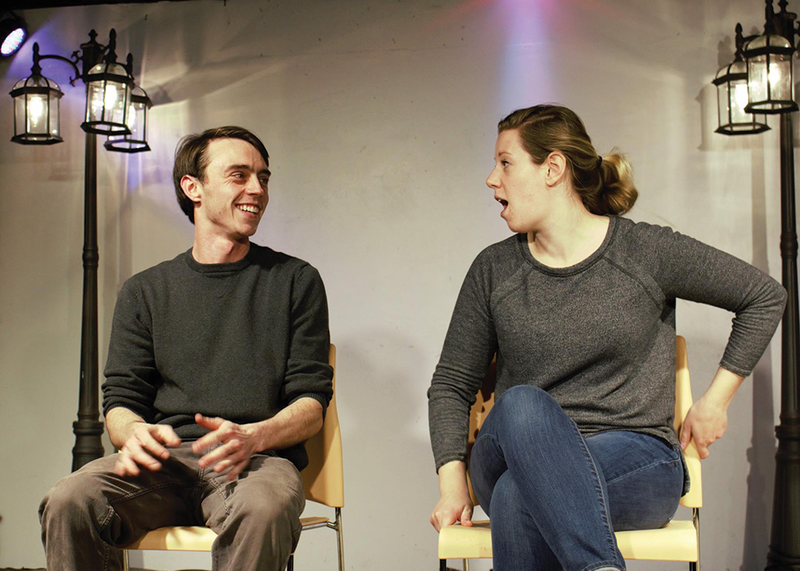 But this showcase offers a unique angle in its focus on two-person improv teams. "I wanted to do something that was more like, 'Let's do the Salt Lake experience, and let's focus on duality,'" Susi-Dittmore says. "We have this city that's a desert surrounded by mountains. That right there is a duality." Susi-Dittmore herself is relatively new to that local duality. The Boston native began her improv journey in Chicago, after receiving her graduate degree in writing from the School of the Art Institute of Chicago. "After I graduated, I realized there was a whole performative world in Chicago that I hadn't stepped into," she recalls. "So I started doing improv and fell in love with it because it was terrifying. Terrifying and wonderful. There's nothing like being on stage with a bunch of people who trust you, and who you trust." It was also in the Chicago improv scene that she met her now-husband, Calvin Dittmore, a Utah native. When the two relocated to Utah in 2016, they began performing locally, and Susi-Dittmore produced monthly variety shows as well as multi-media shows at the Utah Museum of Contemporary Art, focusing on themes related to the gallery's exhibitions. With that combination of production experience—"It's not my first rodeo; just my first of this kind of rodeo," she says—and connections to the wider improv-performer world, she set out to let people know about this new event. That included making use of the online community The Improv Network, which offers a festival submission platform. "I had to actively promote this submission process," Susi-Dittmore says. "A lot of Facebook posting in different groups, all the national and international networks I'm part of on there. Also, a lot of people I reached out to personally are friends, and I asked them to submit. But there are also people I've never met before. And that's both nerve-wracking and really exciting. It's an opportunity to show them what a wonderful city this is." After receiving what she describes as "way more submissions than I expected," Susi-Dittmore locked in a program of 17 pairs, performing in a format that emphasizes a showcase and workshops rather than any sort of competitive component. "I got super excited that people just wanted to be part of this," she says. "We have people who run theaters and other festivals. That, to me, was incredibly validating—that they saw an opportunity to come and be part of a festival that doesn't have a reputation yet. Having 34 people say, 'Yeah, that sounds great, we'll do that,' is really exciting." Susi-Dittmore also is interested in the unique dynamic offered by the two-person teams, which might be unique to audience members who are more familiar with improv troupes that incorporate larger groups into their games. "For me, there's an opportunity to develop a really strong connection with that one other person," she says. "You have an opportunity to have a really good conversation about how you want your show to be. As an audience member, I'm watching two people on stage, and it's only going to be those two people for the next 20 minutes, I feel a real intimacy. Any choices made on the stage are made by those two people. That, to me, is a hyper-intimate connection between those two people, and also with the audience." Even more than the two-person-team restriction, though, it was important to Susi-Dittmore to create a space that was welcoming to every possible kind of performer—a commitment that included using the Sugar Space as a venue because it's operated by women. "I've just been part of so many instances where I was excluded because I was a woman, or thought of as not as funny because I was a woman, and I don't want that for anyone else—only seeing teams that allow men to play," she says. "I wanted to be really serious about running a festival that was inclusive of women, people of color, queer people, people with disabilities." That openness simply seems like a natural extension of the mutually supportive nature of improv and the interplay between performers. While an event like this provides a place for improvisers from all over to share ideas, Susi-Dittmore feels strongly about the human component. "For me, improv is really about human connection and emotion—having something earnest and real and genuine happen between two people," she says. "If something is technique- and tool-masterful, but also really honest—if you can combine those two, holy crap!"